Explore mediums individually or combine: encaustic, collage, transfer, printmaking, stenciling, painting. Instruction and guidance from a 25 yr. professional artist and certified art teacher. Thursday March 15th – Register Now! Explore mediums individually or combine: encaustic, batik, mixed media, collage, transfer, printmaking, painting. All materials are provided. Work at your own pace and in whatever direction you’d like. 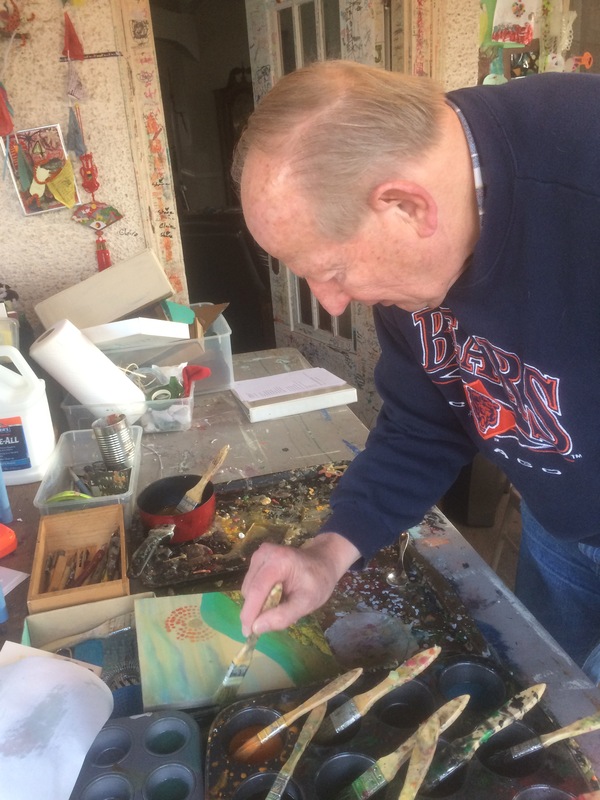 Learn on your own and with guidance and suggestions from a 25 yr. professional artist and certified art teacher. Experiment with combining encaustic with all types of media, interweave, socialize and enjoy! Thursday March 8th 10:00-12:00 Register Now! Join jewelry artist, Amy Renzulli for a workshop in basic techniques to get you started making your own original creations! Do you love the look and feel of tassel jewelry? Learn to make your own leather tassels for earrings, necklaces and more! Bring anything you have for inspiration, pieces of chain, broken bits of jewelry, and chain. We will bring the leather, tools and other supplies. If you happen to have a fabric cutting wheel that is usually used for quilting, please bring it. Working with leather in this way is fun and provides an instant beautiful reward! Hope to see you there. More expensive gems and pendants will be available for sale. Learn a range of techniques and work at your own pace in these mixed media workshops. 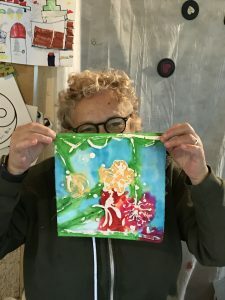 Techniques include: collage, encaustic, transfer, print, montage, mixed media painting, drawing and more. Encaustic consists of natural bees wax and dammar resin (crystallized tree sap). Heat is used throughout the process, from melting the beeswax and varnish to fusing the layers of wax. The medium can be used alone for its transparency or adhesive qualities or used pigmented. The medium is melted and applied with a brush or tool. Each layer is then reheated to fuse it to the previous layer. Image transfer is the act of transferring something that has already been printed onto another surface. The source materials can be any media that can be somehow manipulated to release from the original surface and bind to a new surface, generally prints and photocopies from ink jet or laser printers. Learn how to interweave collage and transfer images into a cohesive painting incorporating mixed media and or encaustic. Develop your drawing and painting skills and discover numerous other processes through experimentation. Mixed media refers to a work of visual art that combines various traditionally distinct tools and techniques involving the use of two or more artistic media, such as ink, graphite and pastel or painting, transfer and collage, that work cohesively within a single composition. Festive and Fun For any Occasion: book clubs, adult birthdays, bridal showers, holiday parties, or just a fun get together with friends! You supply any decorations and/or food and utensils. 2 hours party time, we will open 1/2 hour early for set up and/or decorations. Brief instruction with guidance from professional art teacher, painter. Painting themes, We choose, you choose or we choose together. You Choose the Date, Weekday or Weekend Hours from 9:00 a.m. – 6:00 p.m.